On 10 April 2018, the Oude Kerk will present Germaine Kruip: Works 1999-2017, Dutch artist Germaine Kruip’s first monograph. The book, published by bookshop König Books and edited by curator Krist Gruijthuijsen (director KW Berlin), contains a chronological overview of Kruip’s works as well as essays by Anna Gritz, Stephanie Bailey and Eva Wittocx. 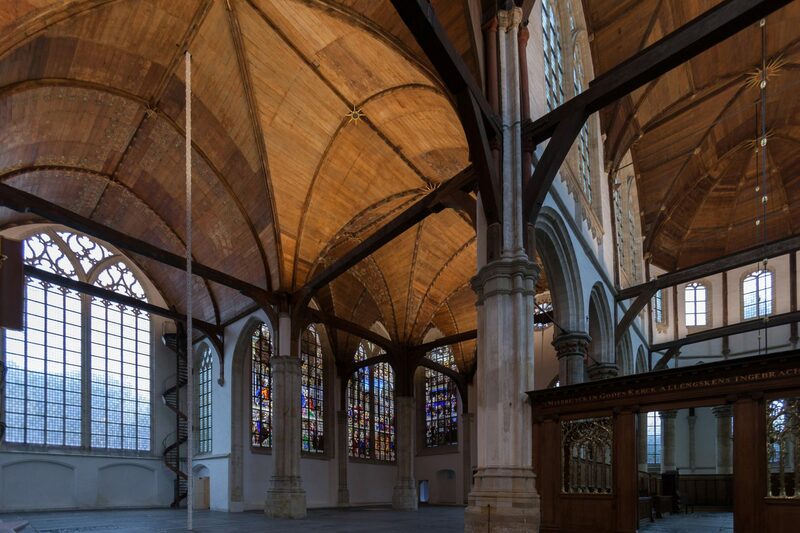 The Oude Kerk hosted Geometry of the Scattering, an exhibition with work by Germaine Kruip, in the winter of 2015/2016 and has and has enjoyed close ties with her ever since. The monograph includes several images from this hotly discussed exhibition. The evening will start and conclude with the performance Rhombus, for which a geometric sculpture is employed as a musical instrument. The rhombus – a diamond-shaped object consisting of two conjoined triangles – is used to perform the piece Silver Streetcar for the Orchestra by Alvien Lucier. In this piece, the triangle player mutes the triangle using the thumb and index finger of one hand while tapping the instrument using the other. The performance reveals the acoustic properties of the metal object. In the case of a rhombus, the instrument produces a double resonance, which emphasizes the overtones even more. Germaine Kruip uses omission in her work to create new perspectives by which people can experience their environment. She investigated how the building was originally illuminated and how light and darkness relate to architecture. Omitting direct light sources and decorative lighting fully exposed the architecture to the natural light cycle. During the exhibition, the quality of light changed by the hour and this subsequently changed the perceived shape of the church. The sunny interior was slowly swallowed by the night. In the dark the only physical intervention, a monumental marble column, appeared as a white-lit, slender line in the space. Germaine Kruip: Works 1999-2017 is published by König Books in collaboration with the KW Institute for Contemporary Art (Berlin) and the Oude Kerk (Amsterdam). foto: germaine kruip, Column untitled (2011-2015), 2015 © wim hanenberg.